Considering Cathy Guisewite’s obsession with hearts and love, I thought a collection of Cathy comics would make an appropriate Valentine’s Day book review. Only Love Can Break a Heart, But a Shoe Sale Can Come Close is a collection of Cathy comics from the 1990s. Love, food, friends, work, and clothes all take center stage in Cathy’s humdrum but humorous life. Cathy’s best friend Andrea from the earlier comics has moved on and only shows up briefly at the end of the book. In Andrea’s place is Cathy’s coworker and friend Charlene, with whom Cathy shares relationship and shopping woes and advice. Irving is still at the center of Cathy’s slow-moving love life, and Cathy jealously competes with golf and Irving’s ex-girlfriend Julia for Irving’s attention. To the annoyance of all the single women where Cathy and Charlene work, Charlene flaunts her happy relationship with her boyfriend Simon. However, the envious coworkers enjoy their moments of triumph when Charlene’s happy expectations are occasionally disappointed. Author Cathy Guisewite reveals in her Cathy comics the funny side of a modern woman’s world of shopping, relationships, and work. This collection of Cathy comics continues to display Guisewite’s witty humor. Additionally, the artwork in Only Love Can Break a Heart, while still in Guisewite’s quirky and childlike style, shows how Guisewite improved as an artist in the two decades since she first began her comics. Note: If you want to read more about the Cathy comics, click here to view my other article on Cathy. A few weeks ago I wrote an article (here) about Dave Coverly’s comic strip Speed Bump, in which I mentioned another comic strip called The Far Side. While The Far Side is no longer being actively produced by its creator Gary Larson, the strip’s magnificence has been well documented in multiple book collections for those of us (like me) who are too young to have ever read it in the newspapers. Larson uses role reversals between animals and humans, science, as well as a keen knowledge of the English language to create humorous situations. 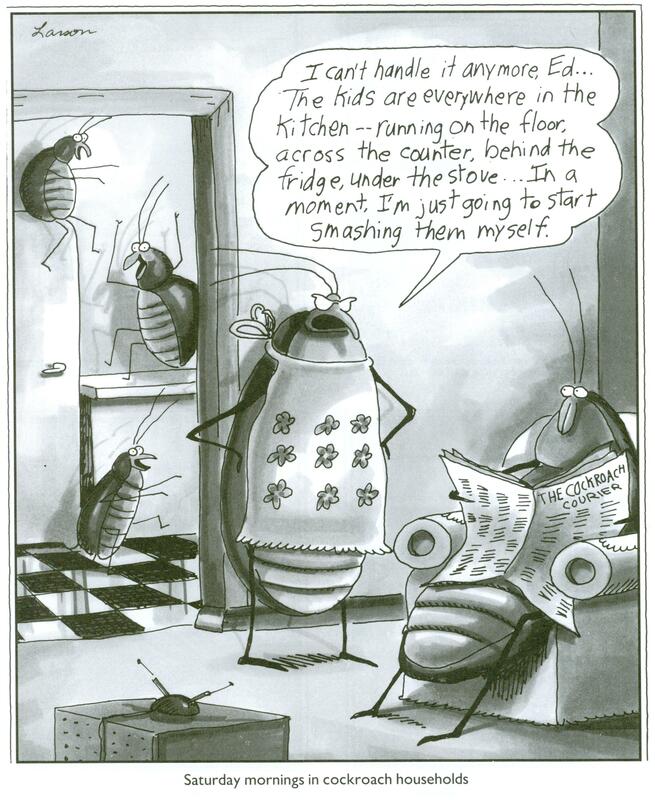 I have always gotten a kick out of reading the collections of The Far Side comics, and would highly recommend them. You won’t be able to find any of The Far Side comics available on the internet, but check at your local library or buy a volume or two for your own collection. Note to Parents: The Far Side contains an evolutionary worldview in many of the strips. However, while possibly being a negative, it could also generate good discussions about science. Also, some of the jokes can be crude and are not suitable for younger readers.